The Sunset Terrace Restaurant is also known as Palace Cafe which is situated inside the City Palace or we can say that it is located inside the Sawai Man Singh II museum. This restaurant is rated as one of the top restaurants of India. The tourists who are coming to see the Palace must come to this restaurant for taking food of authentic Indian cuisine. The Palace Cafe, Jaipur is one of the most popular restaurants of the Pink city. It’s one of the best places where you can get to eat good quality of Indian food. The Sunset Terrace Restaurants is rich and royal with enthusiasm in all aspects of life. This restaurant is popular because of the blend of great spices and lots of ghee in the Rajasthani cuisine which is the unique trademark. In the earlier times, scarcity of potable water led curd and buttermilk to be used in the curries, which is responsible for the food to have a unique taste. Today also, we can find that mesmerizing flavor, within all traditionally Indian as well as intercontinental eateries. Being situated at the center of the City palace, already provides this place an advantage point in terms of ambiance. The Palace Cafe is situated inside the inner courtyard of the City Palace, and you can come across it at almost towards the end of the City Palace sight-seeing. The Palace Cafe is quite popular, and the only dining facility within the palace complex. It offers us both the indoor as well as outdoor dining facilities but the inside part of this restaurant is designed in a fabulous way. The interiors of the restaurant are nice and impressive. We can see the paintings on the walls of this restaurant which are designed beautifully in a traditional way. The furniture also gives us the traditional ways which are offered by them. These things increase the beauty and charm of the restaurant. The open-to-sky restaurant offers a varied menu to choose from while taking in the magnificent natural scenery. The Restaurant is managed by professional service staff and expert cooks. Restaurants offer both Vegetarian as well as non- vegetarian dishes to its customer as well as it also includes regional food. To prepare the dishes a large number of authentic Indian spices and herbs are used. The food is very delicious; even we can compare the food with that which is offered to the Kings. Every food item has a unique taste, color and smell in it. Biryani’s and Pulao’s are just simply fantastic. The dishes are prepared by using the fresh vegetables like brinjal, pumpkins, carrots etc. It has a bar and pleasant outdoor tables where we can snack on Indian and continental snacks and main dishes. Eastern side food is also available in the restaurant rather than only Indian. Thus the menu is very good. Services provided by the staff there are also very efficient. You can feel on the top of the world while you go inside this restaurant. 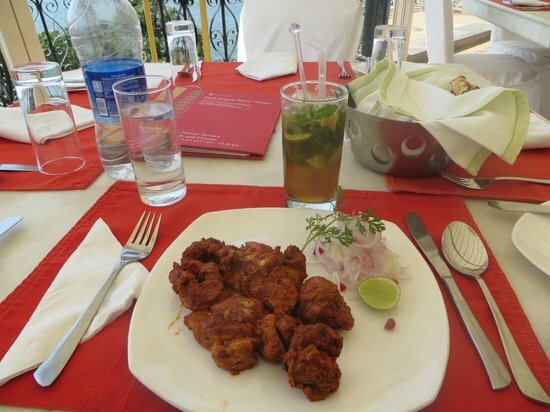 This Restaurant with a matchless Royal ambience is centrally air-conditioned, and has an exquisite courtyard in it. You can also pay them by your credit card.